Click here or on the image for the full series. Original image by Roman Iakoubtchik on Flickr and used here with Creative Commons license. As a journalism professor, I have found there is one thing guaranteed to set off a flurry of frenzied activity in the classroom. It has nothing to do with exams or story deadlines. Rather, it is prompted by a simple question to students: How many own your name as a domain name? Your online presence should show who you are, your interests and background, and showcase your best professional work." This is no trivial matter. Having a website that reflects your professional identity is your digital calling card. Your online presence should show who you are, your interests and background, and showcase your best professional work. Or to put it another way, your personal brand as a journalist. In the journalism of today, the personal brand is becoming increasingly central to the prospects of a young person starting out on a life of reporting. So it is important for students at journalism school, and those starting in the fall, to develop the professional brand that will set them apart come graduation. Some reporters may bristle at the idea of thinking of themselves as a brand, considering it the equivalent of selling out. This overlooks the fact that a journalist’s identity has always been a part of the job, otherwise why have bylines? Through search, email, blogs, social media and more, consumers are gravitating to the work of individual writers and voices, and away somewhat from institutional brand. Journalists who have left legacy news organizations are attracting funding to create their own websites…It would be a mistake to overstate the movement at this point. But for a few journalists at least, there are signs of a new prospect: individual journalists, funded by a mix of sources, offering expert coverage to many places. With journalism shifting toward an era of the personal, rather than the institutional, brand, students need to consider how they are going to stand out as the expert in a knowledge-based economy. 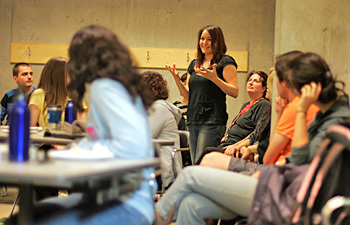 At the UBC Graduate School of Journalism, we encourage students to design a course plan that reflects their interests. In addition to a set of core journalism courses, students can take a number of electives in other departments. This allows them to create a program of study focused on an academic area relevant to their backgrounds and interests. By the end of the two-year Masters program, the students graduate with both professional journalistic skills and an in-depth understanding of areas ranging from the arts to health to the environment. As the world becomes ever more complex, it is imperative for a journalist to have the ability to be rigorous and knowledgeable in their reporting. How you go about building up your personal brand online is up to each student. For some, the best way could be starting a blog on a specific topic to develop a reputation as an expert in this area. It might be by leaving informed comments on stories of interest. Or by simply following key people in your field on Twitter. As Mindy McAdams points out in her 10 tips to building a personal brand, you have to be visible enough that you come up in the top results when your name is put into Google. But above all, you have to be yourself. The brand a journalism student develops online has to be authentic. Don’t even think about trying to fake it — there is nowhere to hide online. A generation ago, a budding journalist could look forward to joining a major news organization and rising through the ranks before heading off into retirement with a solid pension and the fabled gold watch. Today’s generation of aspiring journalists face a much more uncertain future, and not just due to the cuts in newsrooms and the precarious financial state of some news organizations. In the ever-shifting sands of the media landscape of the 21st century, two things are self-evident: the evolution towards digital media and the knowledge economy. The new journalist needs to create and develop his or her niche in this new media ecosystem. Oh, and don’t forget to buy that domain name. Spending a few bucks on a dedicated web address is a sound investment even when, as a student, money is tight. Alfred Hermida is an online news pioneer and journalism educator. He is an assistant professor at the Graduate School of Journalism, the University of British Columbia, where he leads the integrated journalism program. He was a founding news editor of the BBC News website. He blogs at Reportr.net. The one thing I’d note is that I personally don’t think a personal brand is selling out. My blog post which you so kindly linked to brought it up as something I hear all the time. For me – it isn’t selling out as long as your “personal brand” is a persona that is true to who you are. That sounds very wishy-washy and hippie-dippy. But a personal brand is just you living your life online. To thine own self be true especially online because the internet never forgets. As a journalism student myself I couldn’t agree more Alfred. I registered for my own domain name a few months back and (with some help – I’m rubbish at coding) set up a website and I haven’t regretted it. It’s definitely been a worthwhile investment of my time and allows me to showcase my work and keep in contact with fellow journalists and readers. What put me off at first was my lack of coding knowledge, but I don’t think that should deter other people, it can be overcome. I always start by asking people if they’ve Googled themselves? Having just written a self help book on Personal Reputation Management I couldn’t agree with your premise. Anybody who wants to be taken seriously needs to build their brand online. Media Training for Journalists – imperative! I’ve said this to my tv journalism students soooooo many times! I think this is a very important post. Even if student journalists end up working for someone else, they need to own their personal identity on the Web. One goal I mentioned is that when you put your name into a Google search, you want you to pop up first. Can’t believe I received this lecture almost an entire year ago and I still haven’t snagged my URL. I’m totally doing this tomorrow. I even have stories to link to now. Thanks for the reminder Alf. I think there are a few concepts in your post I can incorporate into my class, thanks! Good piece, sound common sense of course – so much so that if your students haven’t already figured all this out then they probably haven’t got what it takes to survive as a journalist. Spot on. This is so important for journalism students to build a profile. Good post. Interestingly In a recent media graduates lecture I run at Greenwich University I asked the students “have you googled yourself recently” no more than 50% had. The shocking thing is that these are switched on, media savvy people that are coming on to the market in summer 2010 – something is going very wrong with our university education system. I am trying to do something about it by getting students to understand the power of their personal reputation and how it can land them that first, elusive start. I would always tell my students that if you don’t determine who you are (through a carefully crafted brand) then someone else will do it for you. Obviously, the results of this creation may not be what the student hopes or can control going forward. This is a good idea, As a video journalist I usually dig deep to unveil the hidden stories and with that I gained international recognition. I remember vividly, my editor came to me and say please I need more of those stories and I guess that is brand coming. Thank you very much. I foresee a future where online media will eclipse traditional media.